Happy Holidays! I hope you had a wonderful Thanksgiving and are enjoying copious amounts of seasonal festivities with family and friends. I, for one, am loving the unseasonably warm temperatures that have been gracing us most days lately! 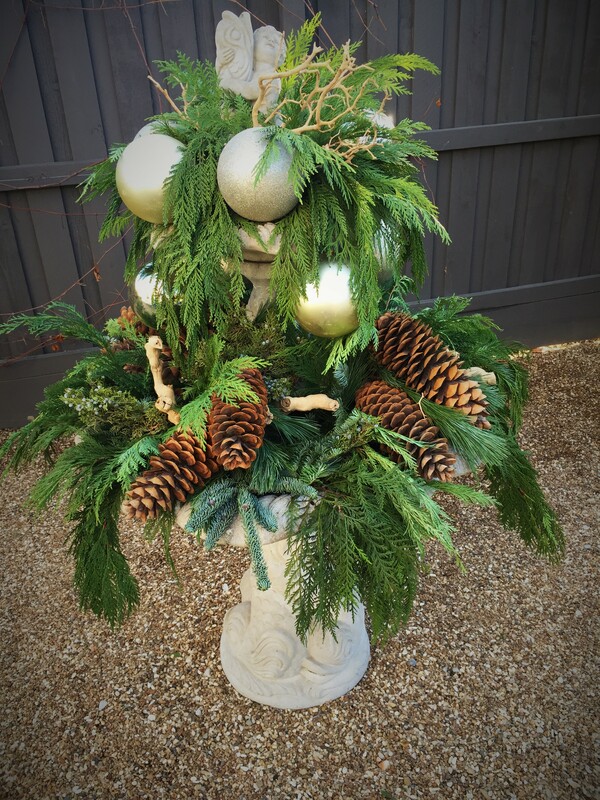 Since the original makeover was so easy, I decided to give it another go…this time filling the tiers of the fountain with freshly cut evergreen branches, large pine cones and other items. Plus, in the spirit of the holiday season, I resurrected the cherub and dolphin who didn’t make the cut last month! 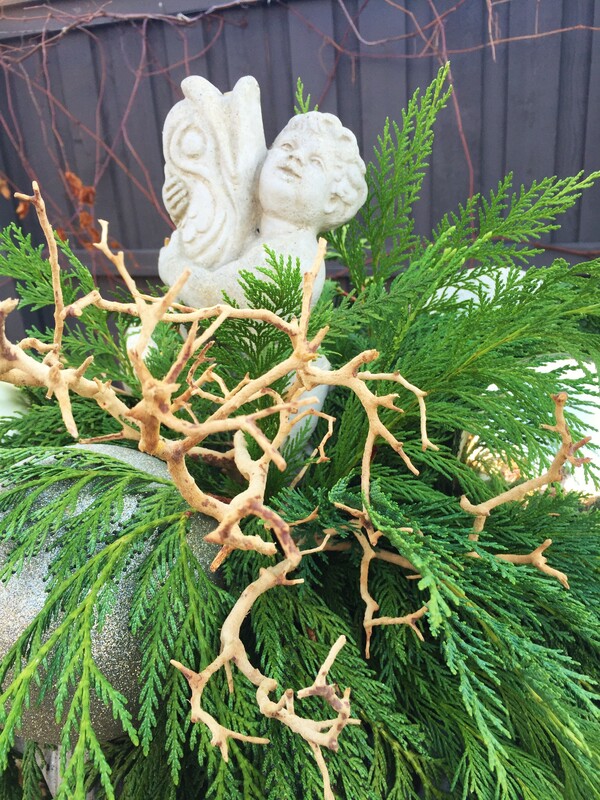 I used the same potting soil from last month’s arrangement as an anchor for the evergreen branches, stabbing them into the soil to make a random, yet balanced composition. 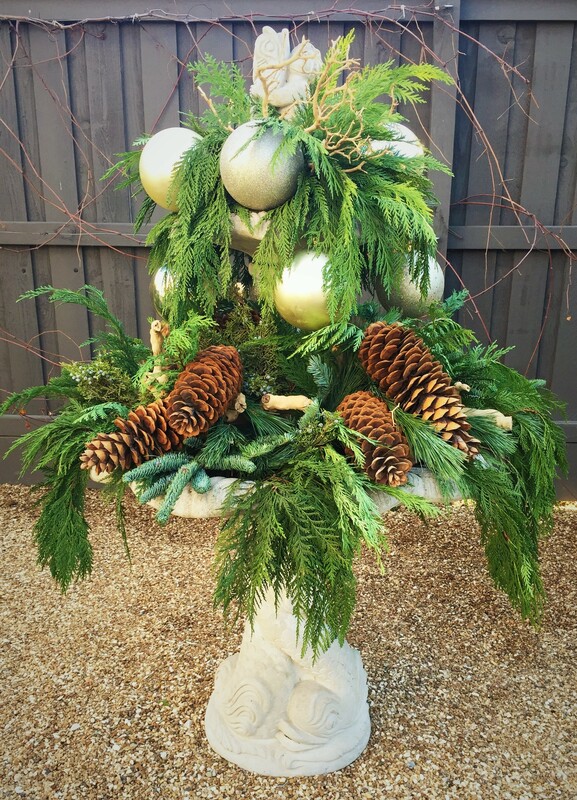 Then I added sculptural branches of Manzanita and sandblasted grapevine, along with large, sugar pine cones that are secured to some of the sturdier evergreen stems using florist’s wire. Finally, I gave Mr. Cherub and his fishy friend a little bling in the way of some shiny Christmas ornaments leftover from another project. And voila! 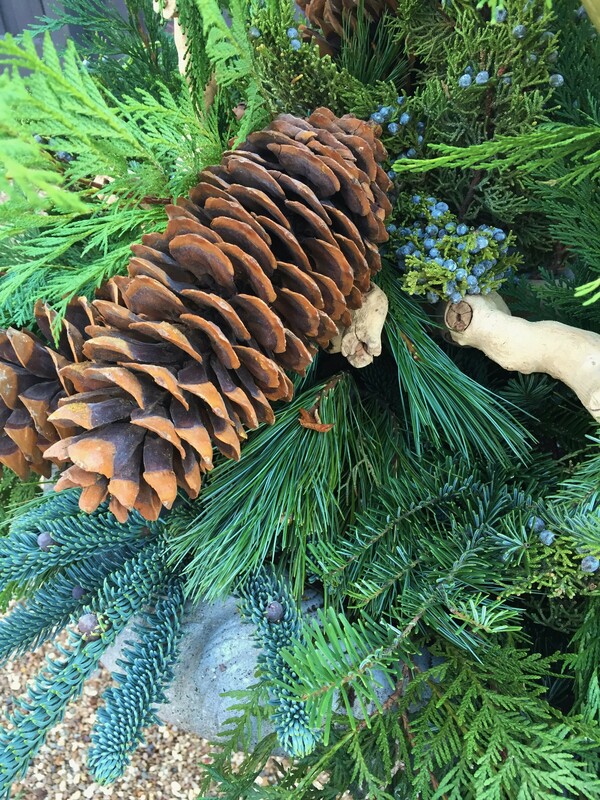 A unique, holiday display made from natural elements and leftover treasures. 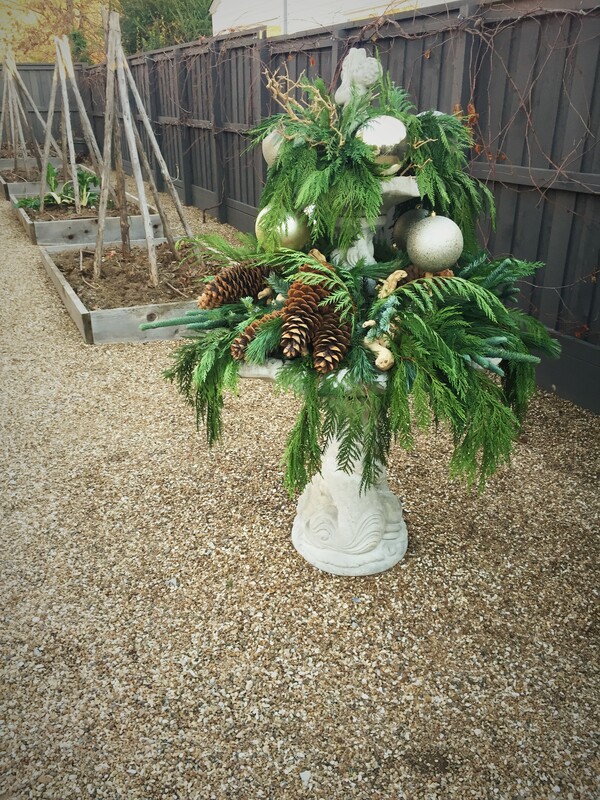 I think it makes a festive addition to the otherwise empty veggie garden. 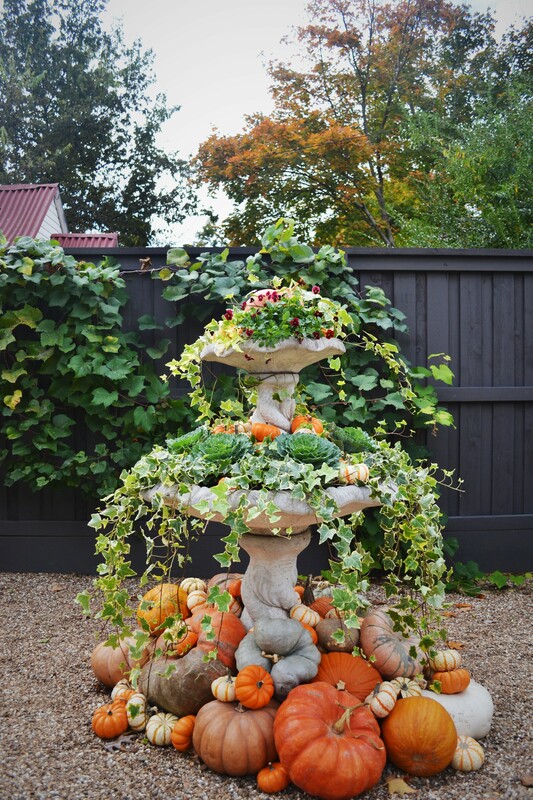 Try making a similar display for your own garden or patio using an old fountain like this or, perhaps, a collection of garden containers. 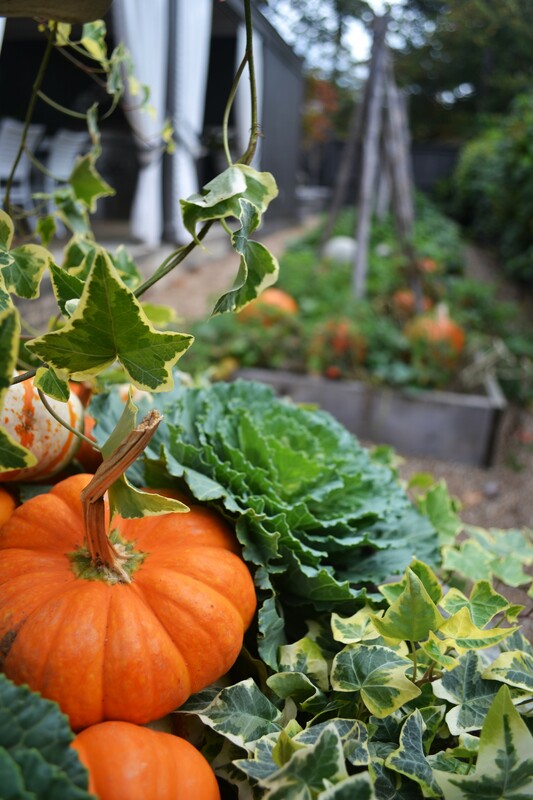 If you are lucky, you might even be able to harvest the fresh greens from your own back yard…or during a leisurely hike. Regardless, just remember to have fun with it and enjoy the season! I don’t know about you, but I always seem to have items lying around that I just don’t know what to do with. They aren’t my favorite things, but at the same time, I just can’t bring myself to throw them away. Such was the case with a concrete fountain my company removed from a client project years ago. 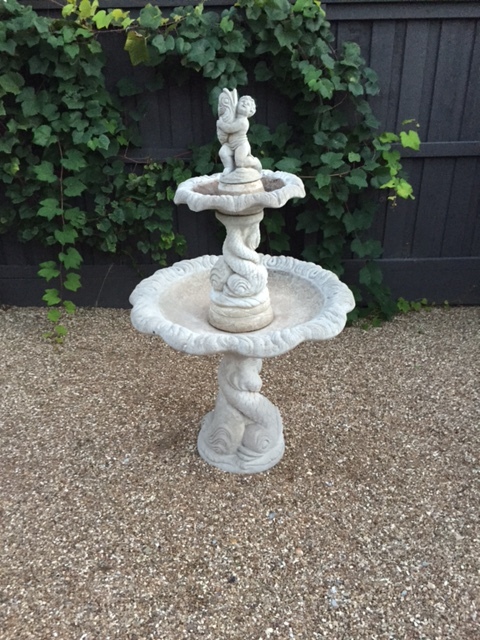 The fountain was a gift from the client’s children, and while it is no longer aesthetically appropriate for his garden, it, nevertheless, holds sentimental value. So, i agreed to keep it safe and sound. The other day (10 years later!) I stumbled across the various pieces of the dismantled water feature and had an idea: why not give this underused, yet meaningful object, a new life? 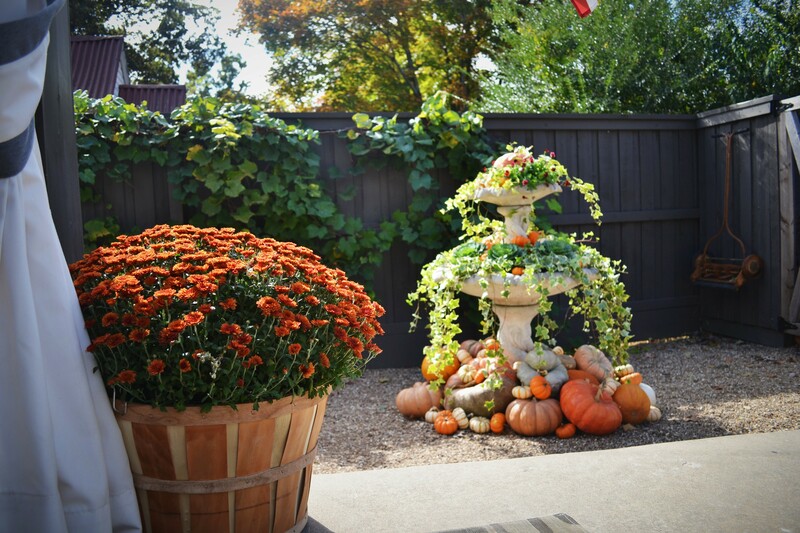 I decided to transform the fountain into a multi-tiered planter and focal point, fit for the fall season, and thought I would share the metamorphosis with you. 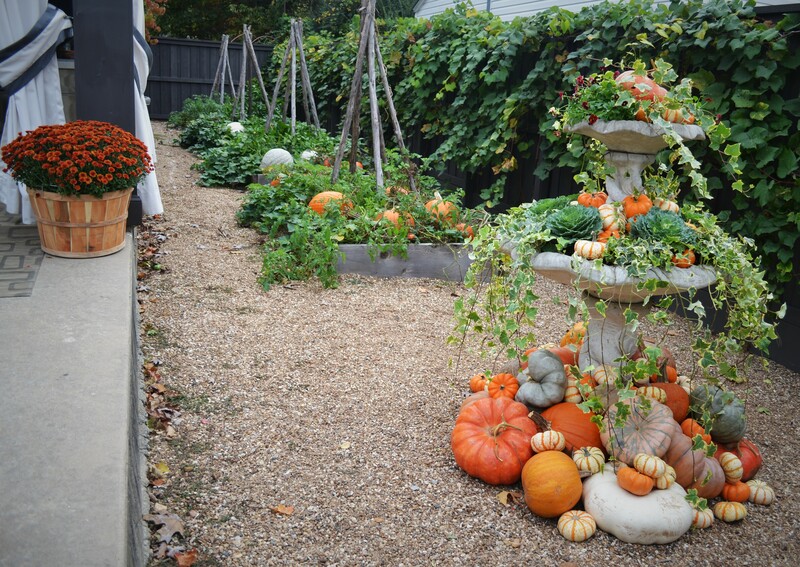 I hope it will inspire you, perhaps, to rethink some of those items around your garden that are in need of a new life! Now I’m no killer, but be forewarned…the cherub and dolphin go to fountain heaven before the end of this story! 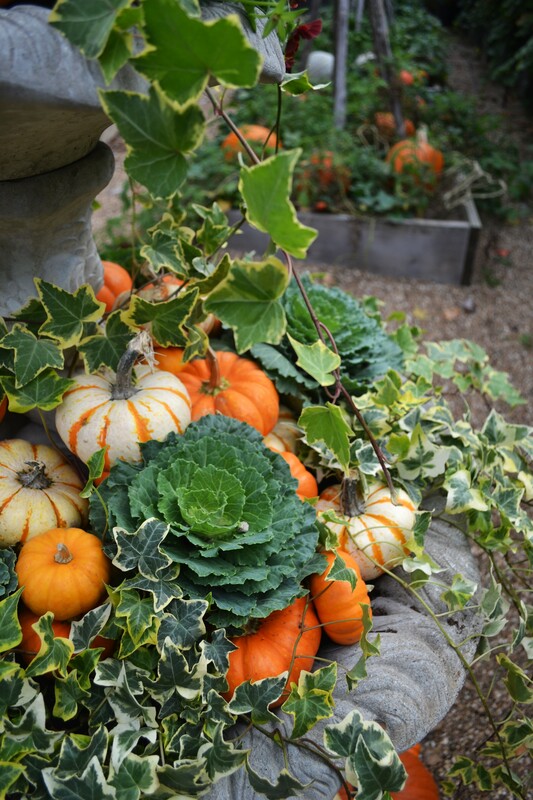 Other than ordering these dual deaths, all I did was to fill the tiered bowls of the fountain with quality potting soil and to plant a mixture of variegated ivy, ornamental cabbages and violas. 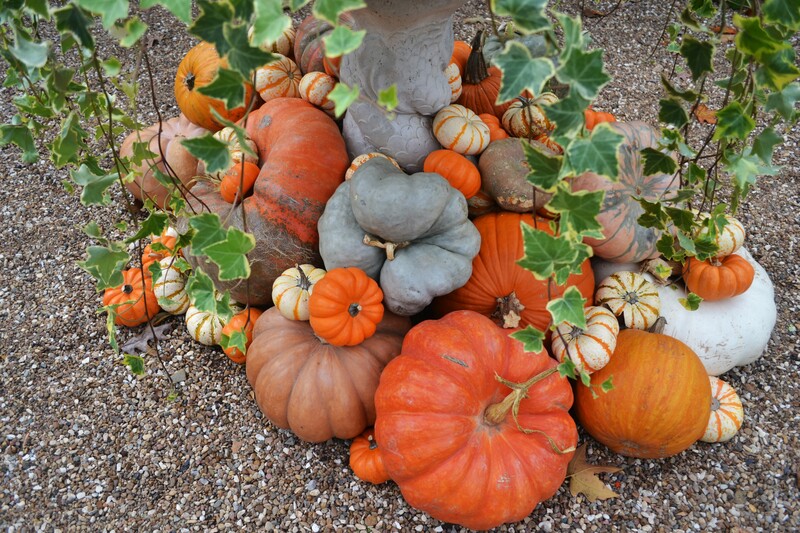 Then, I scattered miniature pumpkins throughout the foliage to give the display a seasonally appropriate ‘cornucopia’ effect. For good measure I added a heaping pile of pumpkins around the base of the fountain, as much to hide another dolphin I wasn’t able to harpoon as for any other reason! And that was about it! 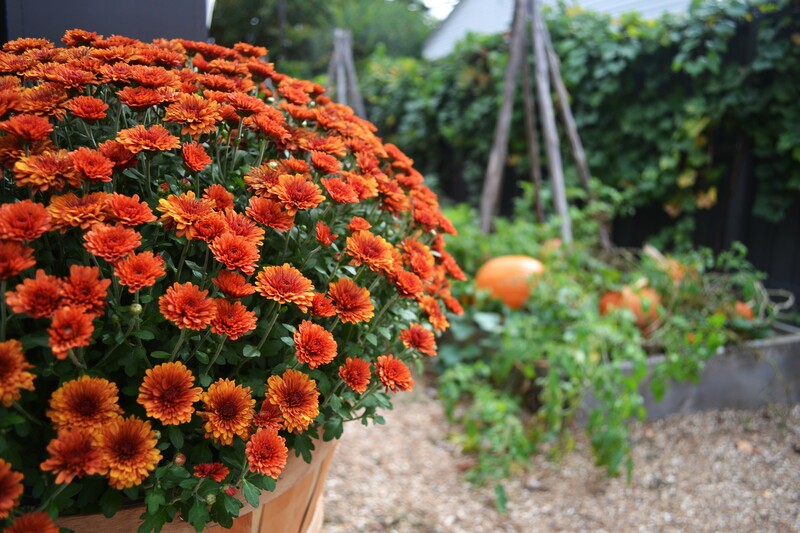 While I was at it, I placed a lovely, rust-colored mum on either side of the entrance to the cabana, and for sheer amusement’s sake, scattered pumpkins and squashes randomly throughout what was left of the vegetable garden for an instant ‘punkin patch’. Hey, sometimes girls just want to have fun, right?! And, that’s all folks…a fun and easy project that gave me new appreciation for something that had gone unnoticed for a long time. 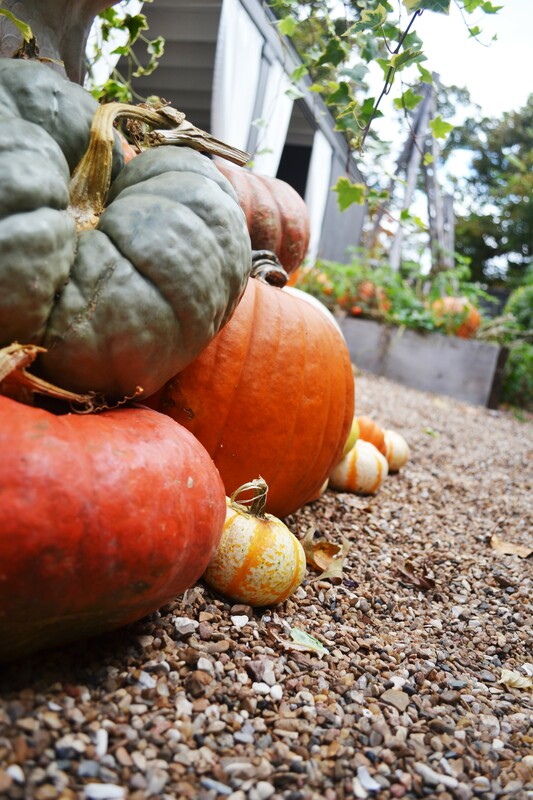 Take a look around your own garden, and see what you can find that is in need of a makeover. I guarantee something will call out to you. 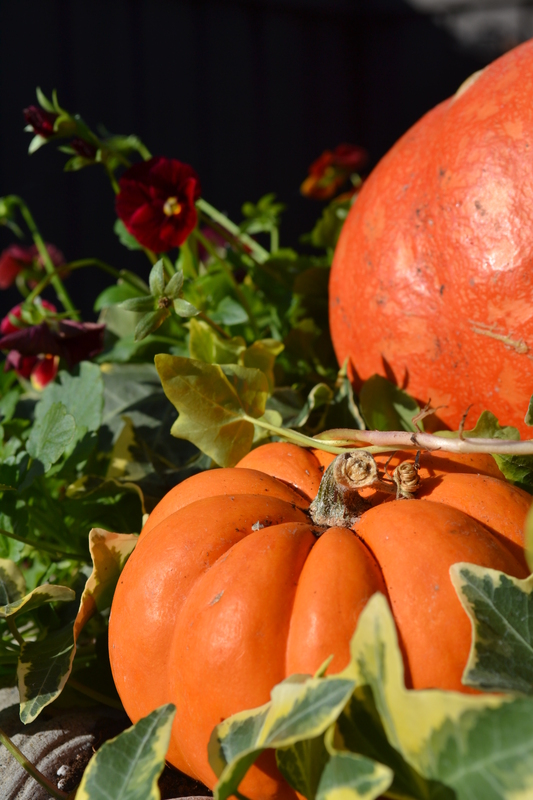 Have a wonderful autumn and a very happy Thanksgiving! See you next month. Follow the Outside the Box house through the seasons, by reading Daniel Keeley’s other posts, HERE. Whew…it has been an exciting month at the Live Outside the Box House! In addition to the regular hustle and bustle of spring, we hosted three events: a VIP client party and two home and garden tours. Needless to say, we have been extra busy making sure everything was in tip top shape, and I am happy to report that everything has gone off without a hitch. In the garden, this first year’s tulips were spectacular. I chose a blend of 3 different white varieties that bloomed at slightly different times. This provided the maximum amount of bloom time, and the tulips lasted at least a month. The dogwoods in the front garden were also beautiful and were kind enough to hang around for all of the special events we had over the past month! 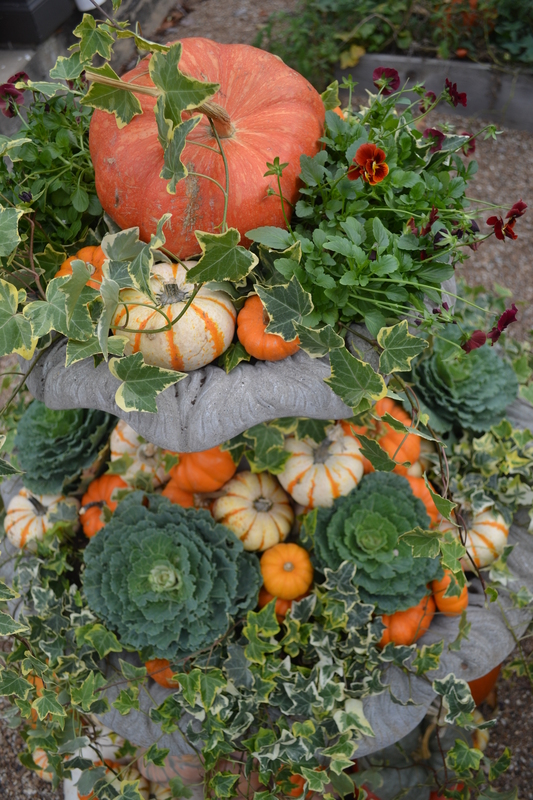 Near the front door, the giant urns received their seasonal plantings, as well. I decided to anchor the urns with a central boxwood topiary. The triple standard forms give dramatic height to the arrangements and also a bit of added formality. 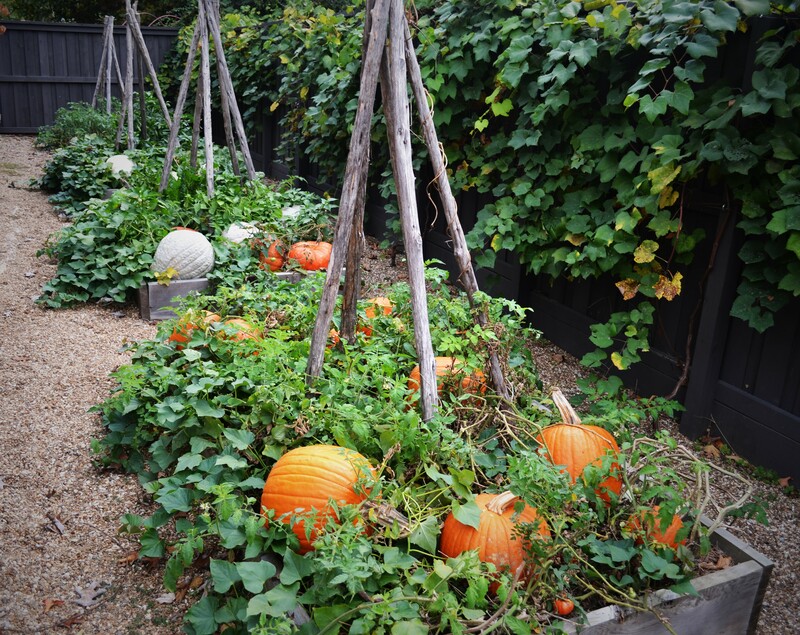 They are under-planted with a simple mix of white scaevola and asparagus fern…one of my all-time favorite mixtures. Around the corner the perennial garden is filling in nicely, despite the fact that all the butterfly bushes died back to the ground during the harsh winter storms we experienced. Also, as you can see, there is a new addition to the garden…a fountain! I have always wanted a fountain in this location and have been counting the days until it could be installed this spring. It is a wonderful, geometric vessel I commissioned from concrete artist, Jason Pledger of Forever Designs, LLC in Fayetteville. I am so excited to have it in and am enjoying the splashing sounds of the water as they waft throughout the garden and into the house! The most exciting aspect of the past month, however, was all the wonderful visitors who came to share in the garden and outdoor living spaces. As I mentioned, we had several groups come by, including some lovely ladies from the Little Rock Garden Club. They were in town to visit several gardens, and it was an honor and a thrill to have lunch with them at the house. Even though the morning started off looking a bit stormy, the clouds parted just in time, and it was a beautiful and fun-filled visit! 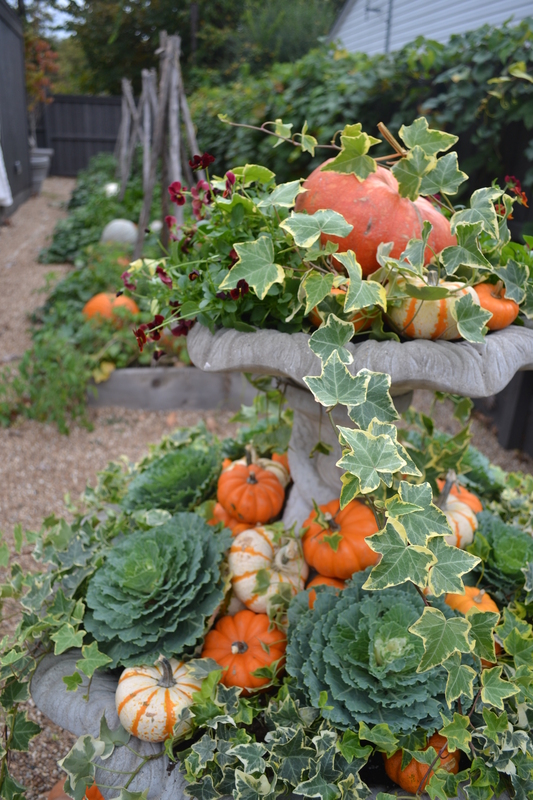 We also had a garden party for our VIP clients this month, which was a huge success. Here is a centerpiece I made for one of the food tables that was super easy to do. I just cut succulents (echeveria) and placed them strategically on a pile of sandblasted grapevine…simple as that! I love the sculptural simplicity of the arrangement, and the succulents have already lasted a month with no care. My plan is to start misting them to extend the arrangement even longer. In the kitchen garden, the Arkansas-native Cynthiana grapevines we planted last fall are leafing out vigorously. As they mature, we will trim and train them to grow all along the fence in the garden, and I can’t wait until they are laden with gorgeous, plump fruit! And, as promised…here is your Nourishmat veggie garden update: I am happy to report that all the seeds seem to have germinated and should soon be yielding their delicious bounty!